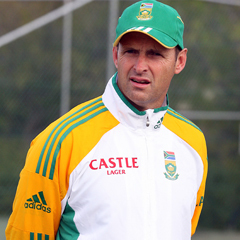 Brisbane - Proteas coach Gary Kirsten believes the Test series between Australia and South Africa will come down to “key moments”, as the teams put in their final preparations ahead of the opener starting here on Friday. The squad pulled into the Gabba for a lengthy and intensive session on Tuesday, eager to continue with their build-up which started in Sydney last week. “Any preparation for a game is good,” Kirsten said about the fixture against Australia A. “It pulls the team together and it allows us to work specifically on what we need to do. The intensity will taper off as the week progresses, as the players look to maintain mental and physical freshness ahead of the battle for No 1. Kirsten refused to be lured into thinking that Australia poses a weakened challenge, after the loss of Shane Watson to a calf injury and poor form from their top players in matches leading into the series. “Any guy can score runs in a Test match, we have to make sure that we do our business right,” Kirsten said. “We have looked at areas that we can exploit within the Australian team as they would do with us. Tickets for the match have been selling fast, with locals anticipating the biggest non-Ashes crowd at the Gabba since 1995.